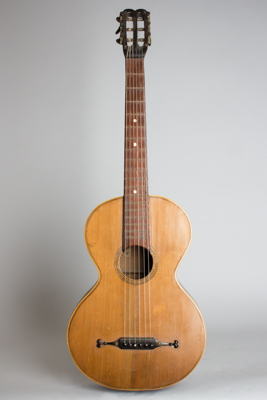 Romantic Guitar, labeled W. Kieser, c. mid 19th century, natural finish. Germanic-style guitar with elaborate multi-panel veneer back. Sides heavily inlaid with decorative panels and half-herringbone purfling; herringbone soundhole ring. Carved decorative-end bridge with brass fretwire saddle; handmade geared tuners. A very attractive decorative guitar which is also quite playable. Overall length is 34 1/2 in. (87.6 cm. ), 12 1/4 in. (31.1 cm.) wide at lower bout, and 3 3/8 in. (8.6 cm.) in depth at side, taken at the end block. Scale length is 24 1/2 in. (622 mm.). Width of nut is 1 5/8 in. (41 mm.). Very Good Condition.